Take a look at this colorful and healthy fall dish! This Cast Iron Skillet Harvest Squash recipe is the perfect comfort food for these cold weeknights you just want to do a one-pot meal and have something filling. This recipe takes 1 yam, 1 butternut squash, 1 acorn quash, and a couple sweet ingredients like apples, pomegranate and spices. The sweetness of this dish is balanced out by cooked and crumbled bacon, which also lends a hearty breakfast-for-dinner flair. One great thing about this dish is that it uses ingredients in season now. We have an abundance of great looking varieties of squash at all of our super markets right now, and this recipe is a good combo of several varieties of fall and winter produce. If you are not a fan of yams, you can always substitute for a regular potato diced well. The pomegranate arils (seeds) give great color and sweetness to this dish. If you or your family haven’t tried a pomegranate, this is a great dish to introduce the new flavor. I think this skillet dish is also more kid-friendly than many combination skillet meals, too. For one reason, it has bacon! Bacon is always a huge hit around here, even in a casserole or mixed in a skillet dish like this. There are also no other strong flavors like garlic or onion in this recipe. For meal ideas using this recipe, you could serve this along with some biscuits and eggs for a hearty breakfast (or breakfast for dinner) or with a light grilled meat for a heart healthy full dinner. If you or your family are not meat consumers, you can always consider skipping over the bacon or adding in another firm veggie such as eggplant or carrots. This recipe is flexible and a good way to use what you have in the kitchen! Since it only cooks for 25 minutes, this dish can be on the table within an hour on a busy weeknight with little time spent on prep. This would also be a GREAT one dish leftover to take to work or school…if there’s any left. 🙂 Enjoy! -Over low heat melt the butter then begin to add the diced squash, yams, and apples. -Increase the heat to medium stirring occasionally. -In a small bowl stir the cinnamon and brown sugar together. -When the juices from the squash, yams and apples in the skillet begin to escape slowly add the brown sugar mixture. -Cover and continue to cook for 25 minutes on medium heat or until the squash is tender. Checking often. 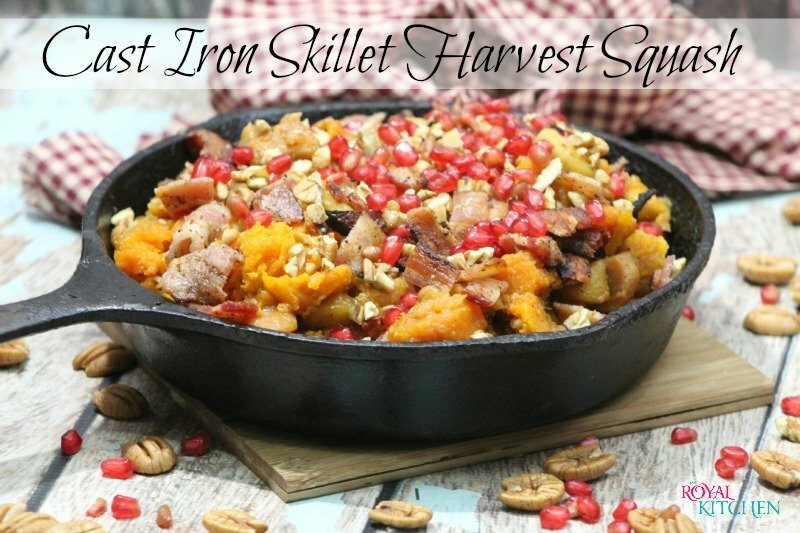 -Sprinkle the crumbled bacon, chopped pecans and fresh pomegranate on top before serving.